Hibiscus syriacus 'Lady Stanley' is an erect, deciduous shrub with dark green foliage. 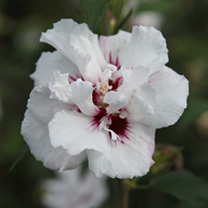 From late summer into autumn, this beautiful ornamental shrub puts on a spectacular show when most other plants are fading; producing large, double, pink-flushed, white flowers with dark red centres in abundance. Flowers July-September. Height 200-250cm. Supplied in a 3 litre pot.